Is this all you've got, Hurricane Season? Boo-ring. Hurricane Ida's winds have strengthened to 100 miles an hour as it moves across the Gulf of Mexico, making it a Category 2 storm. A Hurricane Watch has been extended to the Florida panhandle. 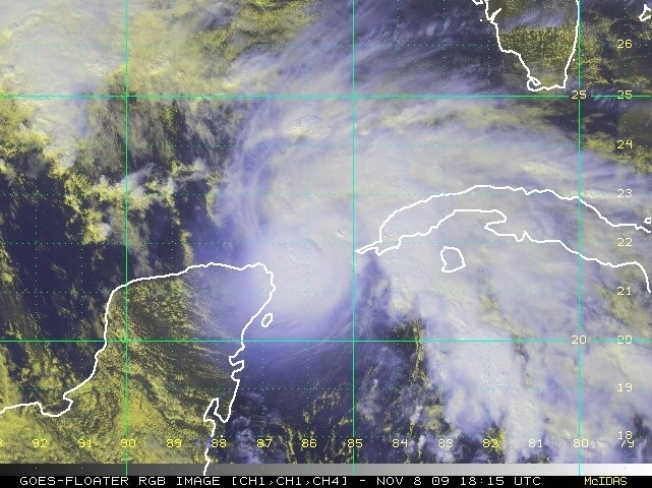 Though watchers at the National Hurricane Center here in Miami believe Ida will lose strength when she interacts with a dying cold front in the Gulf, outer bands of wind and rain are currently whipping the Yucatan Peninsula of Mexico, where a Hurricane Warning is in place, and a tropical storm watch has been issued for western Cuba. Scientists expect a weakened Ida to make landfall sometime on Tuesday.